Prominent & Leading Manufacturer and Exporter from Mumbai, we offer Cosmetology Medicines such as Botox Injection, Allergan Botox Injection, Latisse Injection and Juvederm Injection. 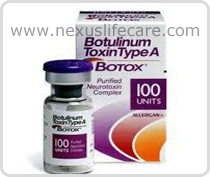 Uses:- Allergan Botox Injection is used in cosmetic medicine to treat moderate to severe brow furrow (glabellar lines), uncontrolled blinking, lazy eye, wrinkles, and facial creases. Allergan Botox Injection procedures use a small amount of diluted botulinum toxin that enables controlled weakening of muscles.